The indicator automatically identifies the 1-2-3 pattern on the chart. 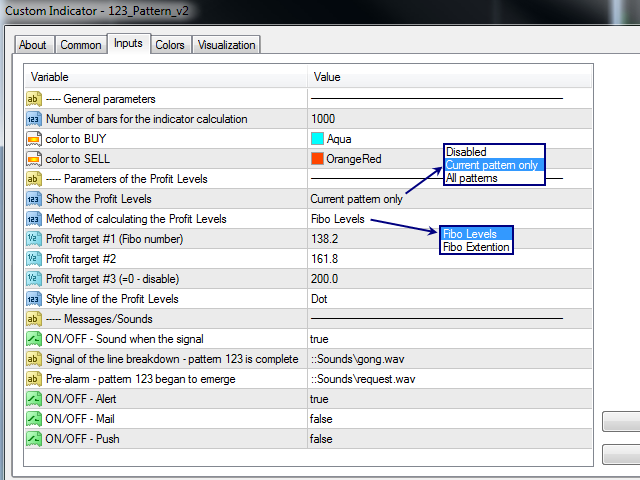 The indicator is able to monitor the formation of pattern in real time. It informs the trader when the pattern is completely formed (when the price breaks the line in point 2) and displays the completed patterns in history. The patterns are never redrawn. The indicator can identify patterns on any instruments (currency pairs, stock market, gold, etc.) without the need to adjust to each instrument. Simple and clear visualization of patterns. The indicator determines the possible targets for triggering the pattern. The targets are calculates based on the Fibonacci levels or the Fibonacci extension (set by the Method of calculating the Profit Levels parameter). From one to three targets can be calculated. 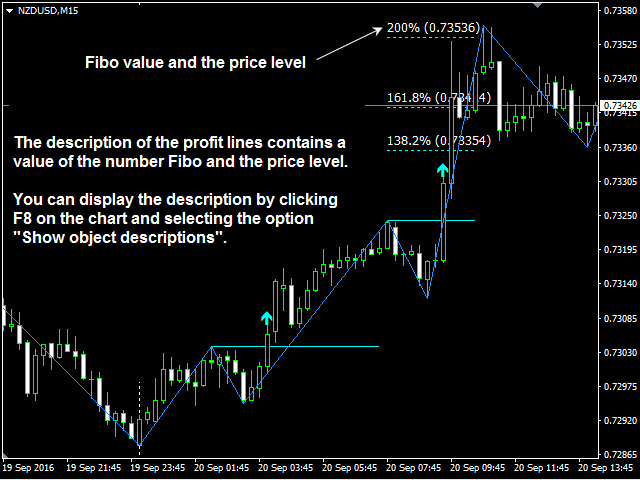 These targets have a description on the chart, which contains the Fibonacci number and the price level. In order to show them, enable the display of graphical objects descriptions (press the F8 key on the chart and select the "Show object descriptions" option). The indicator uses a custom proprietary non-redrawing ZigZag for determining patterns, therefore the indicator never repaints its signals. The indicator generates audio and text message when a pattern is formed. It features sending email messages and push notifications to mobile devices (the 'ON/OFF-Mail' and 'ON/OFF-Push' parameters). The 123 pattern can indicate either a reversal or a trend. 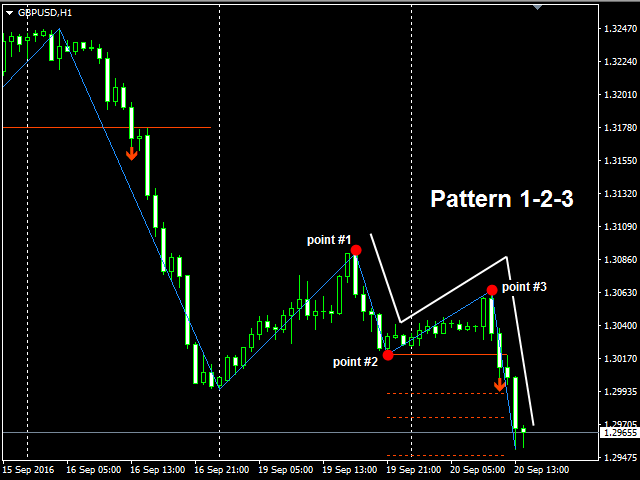 The 123 pattern is effective on any instruments and timeframes from M5 to MN. The greater the number of bars forming the pattern (from point 1 to point 3), the greater the price movement is predicted after breaking the pattern. 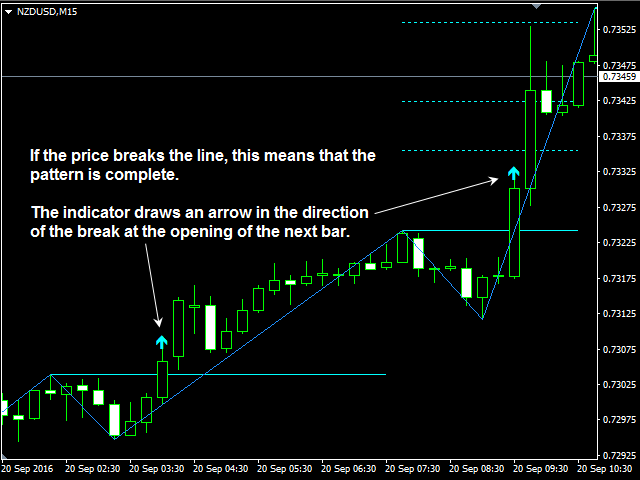 If point 1 has a pin-bar (Hammer or Shooting Star in candlestick analysis), it strengthens the pattern. 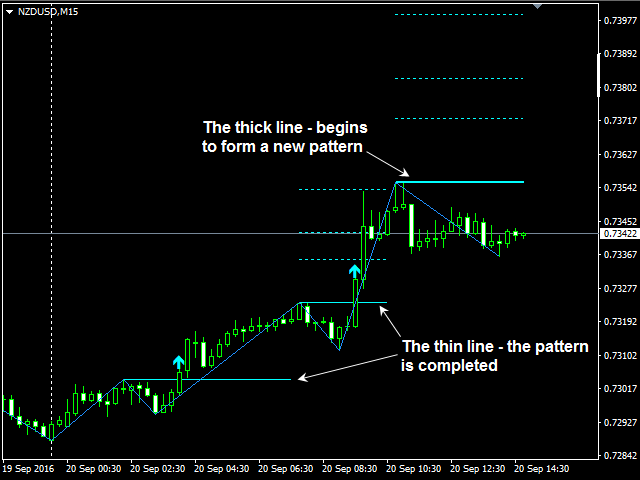 For Intraday trading, it is recommended to look for the pattern only on the European and American sessions. 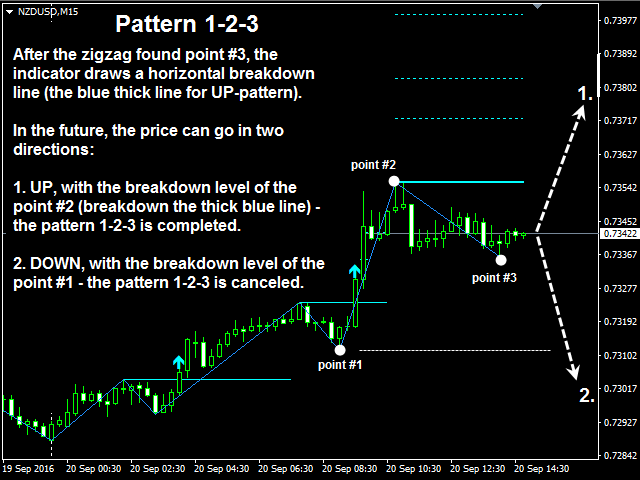 According to the trading system, a pattern is considered to be triggered when a bar breaks the line at the level of point 2. That is, the bar must close on the other side of the line, and not simply touch or pierce it. However, the indicator can also consider a simple touch of the line from point 2 as pattern triggering (parameter "Method for pattern triggering"). Method for pattern triggering - choose method: "Touch of the line from point #2" or "Breakout of the line from point #2"
Pre-alarm - pattern 123 began to emerge – name of the sound file played when a pattern starts to form. 1. Based on traders' request, a new pattern triggering method has been added, in which the price only touches the line from point 2 (parameter "Method for pattern triggering"). 2. 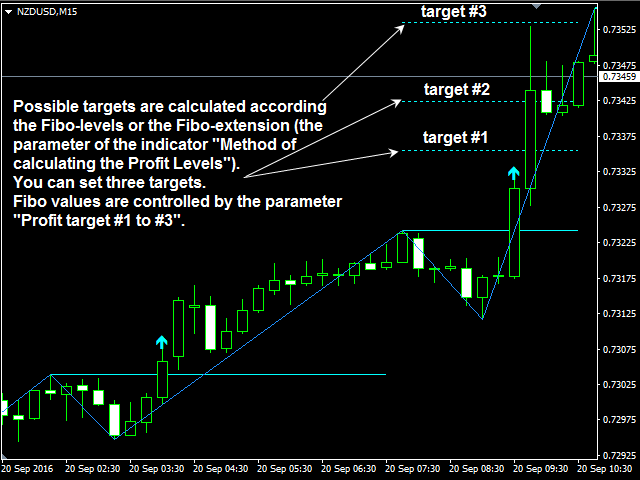 Added two additional Fibo levels for target calculation. 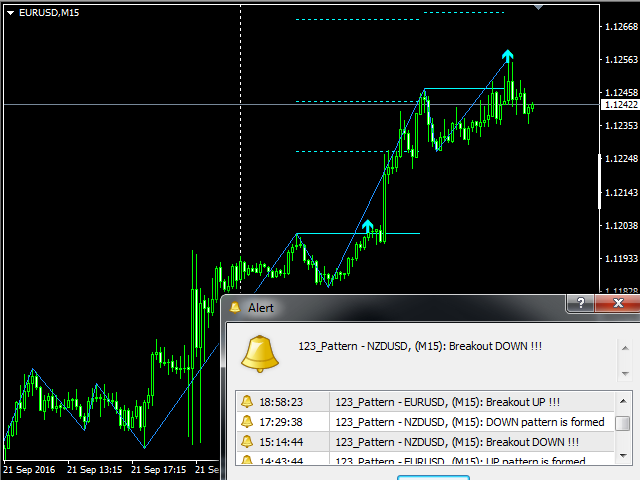 Now the indicator has five levels for each pattern. The level will not be displayed if it is 0. 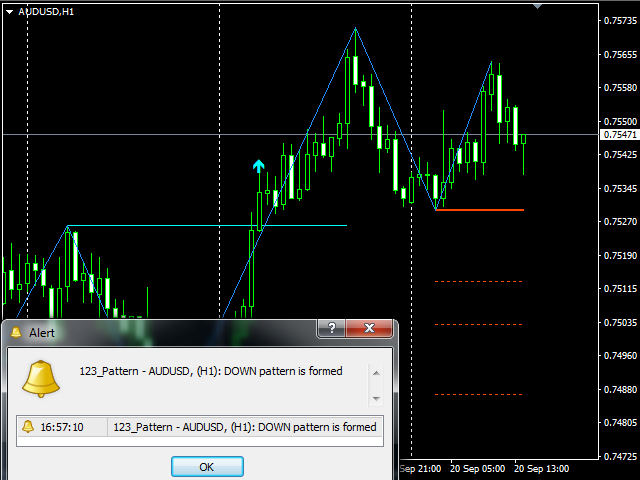 Fixed a bug due to which the indicator sometimes painted additional lines on the chart.